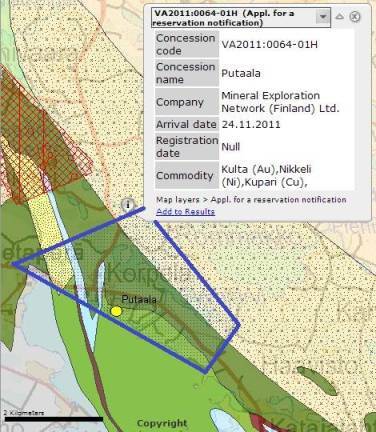 The Putaala claim reservation has been made based on preferable geological position in the southern part of the Kuhmo greenstone belt. Location: 16 km WNW from Kuhmo. Gravel road to the area, 0.5 km to a sealed road. Total area – 7.1 sq.km. The license includes Putaala late Archean orogenic drilled gold occurrence located in the license area. The best intersection from twelve diamond drill boreholes – 1 m @ 11 g/t of Au. A number of boulder samples with gold grade 10-44 g/t were found in the area. Ground magnetic survey is planning for 2013 MEN’s field program.